When innovation centres, technology transfer centres, applied research platforms and other similar organisations wish to help industry with innovation, one way could be to assist companies to experiment with new ideas. I will simply refer to these centres from now on as innovation and technology support centres. In most of the places where I work these centres are often hosted by or associated with universities, applied research organisations or technology transfer organisations. One way to support industry to experiment is through various technology demonstration-like activities, allowing enterprises access to scarce and sophisticated equipment where they can try out new ideas. In its simplest form, a facility allows a company to order samples to a certain specification so that the company can see whether a particular process will be able to meet a particular specification or performance criterion. A slightly more intensive form of technology demonstration allows visitors in and a technology and its application is demonstrated (eyes only, no touching!). Very often equipment suppliers play this role, but in many developing countries equipment suppliers act more as agents and cannot really demonstrate equipment. In Germany I saw demonstration facilities where the pro’s showed the enterprises how things work, and then they stood back to allow teams from companies to try things out themselves. A critical role of innovation support centres is to provide industry with comparative studies of different process equipment. For instance, an innovation centre supporting metal-based manufacturers, providing the industry with a comparison of the costs and uses of different kinds of CAD systems could be extremely valuable to the industry. Maker labs, Fablabs and similar centres all make it easier for teams that want to create or tinker with an idea to have access to diverse technologies, reducing the costs of experimenting. However, the equipment in these labs is often not so advanced, but it can often be very diversified. In my experience these centres are very helpful when it comes to refining early idea formation and prototyping. However, helping manufacturers to experiment with different process technologies, different kinds of materials, substitute technologies, etc. is a binding constraint in many developing countries. The costs of gaining new knowledge is high, and the high costs of failure make companies wary of experimenting. c) conducting transparent experiments on behalf of industry collectives. In my experience, graduates from science disciplines often understand how to conduct experiments because their course work often involves time in a lab. They know basics such as isolating variables, managing samples, measuring results, etc. However, engineering graduates often do not have this experience (at least in the countries where I have mostly been working). The closest many engineering graduates will ever get to an experiment is a CAD design or perhaps a 3D printed prototype. Therefore it is necessary for a range of these innovation and technology support centres to assist companies at various hierarchical levels to experiment. failing faster by using iterations, physical prototypes and mock-ups. According to Thomke, results should be anticipated and exploited – even before the results are confirmed. Changing measurement systems not only to reward success, but to encourage the trying of new things (thus encouraging learning and not discouraging failure). Moving from expert opinion to allow naivety and creativity. Preparing for ideas and results that may point to management failures or inefficiencies elsewhere in the firm (e.g. improving a process may be hampered by a company policy from the finance department). Getting multiple companies and supporting organisations to experiment together is of course a little more difficult. Management of different organisations have many reasons to conceal failures, thus undermining collective learning. One way around this could be to use a panel or collective of companies to identify a range of experiments, and then to have these experiments conducted at the supporting institution in a transparent way. All the results (successes, failures and variable results) are carefully documented and shared with the companies. However, to get the manufacturers to use these new ideas may require some incentives. In my experience, this works much better in a competitive environment, where companies are under pressure to use new ideas to gain an advantage. In industries with poor dynamism and low competition, new ideas are often not leveraged because it simply takes too much effort to be different. I know that this is already a long post, but I should like to add that Dave Snowden promotes Safe2fail probes, where teams are forced to design a range of experiments going in a variety of directions even if failure is certain in some instances. In my experience this really works well. It breaks the linear thinking that often dominates the technical and manufacturing industries by acknowledging that, while there may be preferred solutions, alternatives and especially naive experiments should be included in the overall portfolio. To make this work it is really important that the teams report back regularly on their learning and results, and that all the teams together decide which solutions worked best within the context. THOMKE, S.H. 2003. Experimentation matters: Unlocking the potential of new technologies for innovation. Harvard Business Press. The average manufacturer in a developing country often grapples with the notion of innovation. That is why such industries are often called “traditional“, although almost all industries will have one or two outliers. While governments, such as the South African government, offer incentives to stimulate innovation, most manufacturers do not identify with the term “innovation” the way governments use it. For instance, when governments use the word “innovation” they often mean “invention“, in other words something that can be protected, copyrighted and owned (see more about the differences between innovation and invention here). While I understand the argument for patenting and protection, I think this narrow definition of innovation is inhibiting many industries from increasing their productivity and competitiveness by copying what works elsewhere (this is just a process of catching up). It also fails to recognize that in many value chains the manufacturers themselves make components or sub-systems that go into overarching architectures (defined by standards, compliance, specifications), so their design authority is limited in scope. Mutation, addition, alteration, modification – this is what most innovations in traditional industry would look like. They are doing this all the time as their machines get older, but this behaviour is mostly not recognized nor speeded up. Newness, departure, deviation – the bolder enterprises with more financial and organizational capability might try these, but it takes capital to maintain. Most people understand innovation as an outcome, but the word is a noun that implies change and novelty. It is about a shift, even if it is often incremental. The reason why so many of our enterprises in South Africa are not regarded as innovative is because they struggle (or perhaps do not have the organizational capability) to manage several simultaneous change processes. As Tim Kastelle posted some years ago, change is simple but not easy. Although this is often described as a technology problem it is really a management problem (see some older posts here). I would go even further and state that in many industries the margins are so narrow that even those enterprises that have a reasonable management structure would struggle to finance many innovations at the same time. However, in my experience of having visited more than 50 manufacturers every year since 2009, I am always stunned and awed by how ingenious these companies can be. They keep old machines running, often modifying them on the fly. They operate with a fluctuating and unreliable electricity supply, inconsistent water pressure and often hardly any technical support. What policy makers often do not realize is that in developing countries it takes a lot of management time and capacity just to keep the throughput going. The time and effort to go and explore “change” beyond what is necessary in the short to medium term is very costly. The costs of evaluating new ideas, new technologies, new markets and better suppliers are all far greater in developing countries than in developed countries. Yet at the heart of innovation is the ability to combine different inputs, different knowledge pools, and different supporting capabilities with different market possibilities. There are two implications for innovation promotion practitioners. The process of instigating innovation must start with recognizing how companies are innovating NOW. How are they modifying their processes (and products), and how much does it cost? What are the risks that are keeping them from introducing more novelty? Perhaps they could use the Horizons of Innovation to create a portfolio of innovation (change) activities that can be identified at the enterprise or industry levels. It is hard if not impossible for different manufacturers in most countries to figure out what others are struggling to change at a technological level. Use your ability to move between enterprises to identify opportunities to turn individual company costs into public costs (this is often cheaper). Do not take the innovation away from enterprises, but use your meso level technology institutions to try and accelerate the learning or to reduce the costs of trying various alternatives. Be very open with the results to enable learning and dissemination of ideas. The process of instigating innovation must start with recognizing where manufacturers are naturally trying to change, just as a change process in an organization must start with understanding current behaviour, culture and context. Somehow innovation has become so associated with contraptions and narrow views of technology that the body of knowledge of organizational development and management of change have been left behind. Some agreed that innovation is the result of culture. Some said that culture is not only created by management, but also by staff. For instance, the admin pool in a traditional engineering company can be very innovative (and creative) even if the rest of the business is stuck in the 1980s. Somebody told me that creating an innovative culture is in itself a chicken-egg (low equilibrium) situation, because for a leader to create (or enable) an innovative culture takes innovation in itself. You can see where this is going. Then I discovered a recent cartoon in my inbox by Hugh Macleod of Gapingvoid fame. This cartoon says it all. An organization that cannot change its culture (due to too rigid systems, due to lack of management capability, due to its people) has become trapped in time. While some organizations may exist like this due to sheer momentum, due to protection (by law), by continuous funding, or for whatever reason, will struggle to adapt to external change. These organizations are not resilient and they are at the mercy of external supporters (a.k.a clients, benefactors, funders or shareholders). I was also asked how some organizations can still innovative despite a poor innovation culture. Again, it is of course possible to replace a machine, or for a few people in an organization to design something brilliant, or for a new process to emerge. Of course it is possible. But it takes much more energy, determination of a few, and some really tenacity to be innovative in an un-innovative (what is the right word here?) culture. I am sure more comments will come. I appreciated the comments received by e-mail, but wonder why people are not posting comments to this article? Is the WordPress registration process to difficult? Please let me know. And keep those comments coming! Reflecting on the correspondence I have received after my previous post and recent training sessions with manufacturers, I have come to realise that people are looking for tools and tricks to encourage innovation in their workplaces. Sometimes it is actually not even about innovation, but about making up for poor past decisions, such as not investing in technology or market development when they should have. Others think of innovation as a function or as a management tool that can be standardised into a job description or an area of responsibility. While this is possible in some contexts, I don’t find this approach to innovation of much use in the smaller and medium-sized manufacturing firms and the research/technology institution space in which I am working. For me, innovation is firstly a value, a perspective of how organisations should be. When management says, “We are an innovative organisation “or” We want an innovative culture “or” Our reputation is that we are innovative”, then we can move to tools, portfolios, tricks and tweaks (those things that people in innovation functions must attend to). Many textbooks, articles and blog sites on innovation and technology management are then useful. Actually the challenge is to decide which of the bucket loads of advice to use, and consultants such as I typically help organisations to choose a few tools and provide guidance on how to use them fully and consistently. I would dare to say that it is relatively easy to help companies that are already innovative to become more innovative. What really intrigues me is those organisations that do not think of themselves as being innovative, or that are from industries considered to be traditional and not innovative. Perhaps they used to be innovative, or perhaps they are innovative in some areas but not in others. Perhaps they had one or two tricks in the past that have now become irrelevant. These could be extremely competent organisations, such as a university department, a manufacturer of highly specialised industrial equipment or an organisation that simply designs and manufacturers exactly what its customers order. Even if the outputs of these organisations can be described as ‘innovative’, they do not necessarily have innovative cultures that are constantly creating novel ideas, processes and markets. In my experience these organisations have brilliant technical people, but management is often not able to harness the genius, experience or creativity of its people. The main reason for this is not a lack of technique, tools or tricks, but the lack of an innovative culture, leading to a lack of innovative purpose. These organisations are trapped. They are equipped for the past, and they are paralysed by all the choices they have to make for the future. For management, it feels as though everything it has in place is inadequate and needs equal attention, ranging from attracting staff with better or different qualifications to finding new markets, developing new technological capability, sorting out cash flow and capital expenditure, and addressing succession planning. Improving the innovation culture of an organisation is a complex issue. It is not about tasks, functions or tools, but about changing relations between people within and beyond the boundaries of the organisation. Innovation in these organisations is a sideshow, a project, whereas it really needs to be central to the business strategy, a different way of looking at the world. When working with organisations that must improve their innovative culture, interventions like motivational speeches and optimistic visions of the future are not useful and could in fact deepen the crises facing management. Nurturing a culture of innovation goes far beyond establishing or refining innovation management functions. It is a strategic issue that is initiated by top management, but that will soon spill over into every area of the organisation, hence it cannot be driven by a management function called ‘innovation’. Improving the innovation culture process starts with connecting management back with its people. It starts in the present, the now, not with future scenarios, not with using innovation techniques and better analytical tools, and in most cases not with some or other management fad. It goes beyond trying to improve products, processes or business areas, beyond gaps in management’s capability. It must look at the relations between people, between what people know and can do now (or knew and could do in the recent past), and the potential people see to make small improvements. It is essentially about many dialogues happening throughout and even beyond the organisation. After cultivating dialogue, management needs to empower the organisation’s people to allocate resources to activities that strengthen the learning culture, that turn even small improvement projects into processes that broaden thinking, deepen learning and motivate people to think beyond just their specific tasks. When management has the courage to decide to improve its culture of innovation it starts a process that cannot be described as incremental improvement, as that sounds too directed. It is rather like a deepening, or an awakening, where employees are inspired to contribute, and management is more aware of what it can do to enable its employees to become more innovative on all fronts. Of course, management faces the risk that outdated management approaches that do not seek to empower employees to be creative will be exposed, and some tough decisions will have to be made. To nurture an innovative culture requires innovation in itself. It requires management at different levels to rethink its roles from being directive to being enabling, from being top down to being more engaged with its teams. I am currently focused on strengthening the manufacturing sector. I am speaking more and more at meetings and events, in boardrooms and to post-graduate students about innovation. In this increasingly engineering-minded world people frequently ask me for tips on how to get innovation going. However, the truth is that many manufacturing enterprises, especially the smaller ones, are too narrowly sliced into specific functions. They are mimicking large organisations and by doing so are giving up any flexibility and resilience that they might have had. Designers design, manufacturers manufacture and salesmen sell. This functional division of their hierarchy makes information flows about potential improvements, new market opportunities and some old tricks that could become useful again very difficult. The cost of coordination in these enterprises is very high. In these silo-based organisations the cost of finding information, new signals and new ideas from outside the organisations is extremely high, and in general they struggle to learn. Why I mention them is that innovation is something that most organisations are already doing, they just do not recognise it as such. 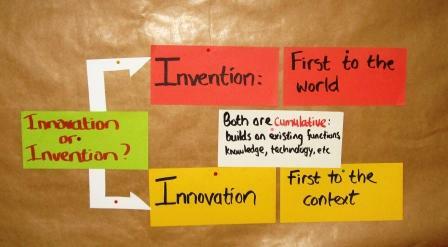 Innovation is lost within functions, or is overlooked because a project is focusing on addressing some or other need. Every improvement project could also be used to change or improve the culture of innovation, to deepen the use of knowledge and to increase capabilities and options for an uncertain future. A second problem is that most smaller manufacturers are mainly focused on product innovation. Which does not mean being focused on knocking the socks off their customers with frequent improvements or brilliant designs. Unfortunately, many of the more traditional manufacturers are focused on how to reduce the price or how to sort out quality issues. This is actually a kind of process improvement, but a very narrow one. The limitation of this incremental approach is that you can at best only grow and develop as fast as your customers can articulate what they want. Competitors or substitutes can also upset market relations by coming up with novel solutions that an incremental approach struggles to generate. A third problem is that innovation is only carried out when customers demand it. It is passive. It functions in bursts to get things right, and then it settles into a problem-solving mode until the next customer makes some unreasonable demands. One should be grateful when clients give you a piece of their mind, but this is still far too passive to my way of thinking. What many manufacturers lack, especially those in the more traditional sectors such as metals and engineering, is a focused effort by top management to build a culture of innovation that is actively trying to find product, process and business model improvements. The effort must be focused internally in order to constantly rethink the business and its core processes, and at the same time it must be focused externally on what customers and competitors are doing. The really good companies are also looking beyond current markets and competitors at new technologies and how they might shape the future. Thus far I have addressed the business perspective. However, research organisations, technology transfer centres and industry support centres can also become trapped in a low-innovation culture. I am currently working with a few industry groups and research and technology centres to find out how these organisations can move beyond the “catching up” and responding to change modes towards anticipating what will come next. This sounds perfectly simple, but by merely mobilising more and more people in the organization to search for what’s next has already yielded amazing results in a short time. Perhaps I am being over-optimistic, but I can already sense the innovation culture change in these organisations as more and more people become involved in searching for possibilities. Here’s an apt quote attributed to William Gibson: “The future is already here – it’s just not evenly distributed”. The first kind of search is to get more people involved in searching for what is already present within the organisation, but is not recognised or is not being used to transform the organisation. The second kind of search is to go beyond the organisation in related and unrelated markets and technologies. Take trends such as the global shift to automation, or the new developments in artificial intelligence and play with these within your organisation. Wonder out loud with your people about what this might mean for the organisation, for clients, for suppliers. How might these technologies or trends influence their investment decisions, their viability or their business models? Use these vague concepts to rethink the organisation, its networks, its technologies and systems. That is what I call instigating innovation, when the dialogue led by the leadership mobilises more and more people within and outside the organisations to start thinking creatively, connectedly and in new ways about the future and the present. Lay a strong foundation for innovation by getting more people to think, imagine, connect ideas and improve.